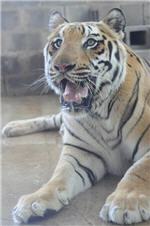 Okemo was a previous resident of Wild Animal Orphanage (WAO) in northwest San Antonio. 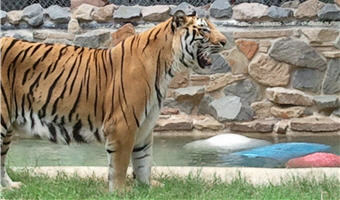 Last year, as a result of financial mismanagement, the facility filed for bankruptcy and closed its doors, leaving roughly 400 animals (including exotic cats, bears, wolves, and primates) essentially homeless. As a result, authorities came to In-Sync for help. Sadly, we have neither the funds nor the space to take in many of the cats, so Vicky agreed to help find safe new homes for some of animals left behind. We first met Okemo during a trip to San Antonio to assess the needs of caring for the remaining cats. We learned that he originally came from a facility in Maryland and due to certain chains of events; he then went to the WAO facility. 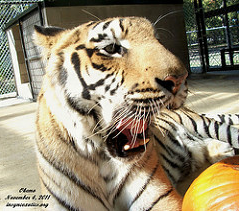 Okemo had been integrated with an older female tiger for about two years until she passed away in 2008 due to cancer. Okemo was once again left alone since that time and was being housed in an area away from all the other animals. Even though we have no plans to integrate him with other In-Sync tigers, you can rest assured that Okemo will never again be alone. Okemo is very vocal and loves to be talked to. He moans and groans with pleasure from the attention that we have lavishly given him since his arrival. He loves getting baths with the water hose and will roll around making sure you get every dry spot. Right now Okemo is very intimidated being around other tigers but we are sure that with time and patience he will learn that having neighbors isn’t really all that bad. For more images of Okemo click here!